The entry form for the Comet's Sports Awards can now be downloded from here (Word document). So now there are no excuses - if you think your's is a great team get nominating and tell the world! Completed forms to be returned to Marcus.Crawley@thecomet.net by 1st December. 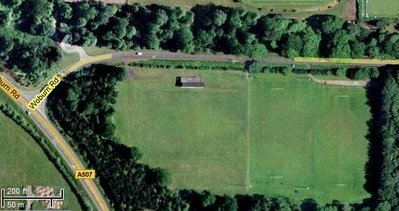 Better news for Sunday - Ely will be bringing a team to replace (at least in part) Westcliff. 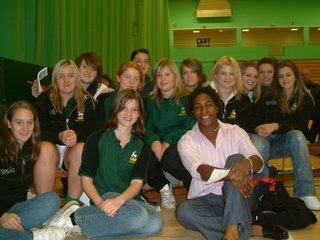 And also at least one girl from Wymondham (somewhere in Suffolk, before you ask) will be joining in with the U14s. All good news, not least because these will also be new girls and a new club we've never played against before (though some of you may know some of them from region, possibly) which is always fun. Next weekend's fixture will be without Westcliff due to their having travel problems (ie. they can't get here), which is partly due to teir thinking we were going to them. Sudbury still on their way though - and Sasha's dad and I are currently trying to see if we can get a replacement for the Essex team. On a more positive note U14 and U17 county squad members will be pleased to know that we're now sorted for the following weekend (12th November). Hertfordshire will be playing Oxfordshire and Essex (as well as Middlesex, if they can get a team out) at Grove RFC. Kick-off 12.30. Where, I hear you ask? Tiny village four or five miles south-west of Oxford. Quite a big rugby club though. U17 Barbarians will be at OAs in St Albans. U14s not in the county squad get a weekend off. Comet Sports Awards - lets get some nominations in! Now is the time to nominate the club, our teams, your coaches, fellow players, or admin people for this year's "Comet Sports Awards". Last year we were in the top three in the club category - this year lets see if we can't do better. One entry might win, but if the same player or coach or team is nominated by several different people the chances of our getting a winner will be much greater. So don't wait for someone else to put a nomination in - do it yourself! And - yes - you can nominate yourself if you wish! The only thing to note is that nominees must live or be based in the Comet's distribution area - so that's Stevenage, Hitchin, Letchworth and Baldock (plus surrounding villages) - which means that our Beds and Suffolk based contingent is out of the running for the individual awards at least. But that does not stop anyone living outside those areas making nominations! Incidentally there are lots of awards like these at this time of year - so if you spot anything else we might apply for let everyone know. Rosie Randall has also been killing time on the PC and has come up with her own memories of Rochford - this time as a Powerpoint (which I've concerted to PDF, thus reducing the file size to managable proportions!). BTW - hope the medals are okay. They were ordered with appropriate engraving, but turned up on Thursday without - hence the labels as there was no time to get anything done. Congratulations to Hayley who is this months U17 player of the month. Hayley collected the most player of the season points for October . In my two inch thick pile of documents I received last week in my role of Regional Programme Manager was one item that will be of interest to you all, I thought. Its a list of positions - and the RFUW's opinion of what abilities a person should ideally have to play in that position. Its a bit technical - but as many of the U17s are starting to specialise it may give pointers to where you need to improve your game, and for others - who may be wondering exactly where their ideal place on the field is - it may give a few pointers. Slight rethink on this now as quite a few of you are interested, but the cost is a barrier, added to which Mike reckons he can organise a tour for us to Devon on roughly the same dates for half the cost. Or even less. Watch this space for more news on this. We have been invited to take part in the English International Festival of Rugby which is being played from 13th-16th April (the weekend after easter). The tournament will take place in Bognor Regis with teams staying at a nearby Butlins Holiday Park. The tournaent has been going for some years, but this year appears to have merged with the Worthing girls' festival and is therefore running competitions for girls teams for the first time. The wider junior club will be sendnig at least one or two teams (probably the age group that won at the Isle of Wight last year) and have provisionally entered a U14 and U17 girls team. Some 4,000 players are expected over the weekend, and the girls competition seems to be likley to involve some 24 teams in three groups (so at least seven matches over the weekend). The cost will be about £134 per person - plus £30 if travelling by coach (which the organisers provide). However, there is a sizable amount of grant support available to us which would potentially reduce the cost pretty significantly. And we have some five months or so to save us as well. So the question is.... how many of you would be interested in going? Obviously the U17 squad is big enough to still go even if a few could not take part. The U14s would need to look to combine with other clubs, and maybe a county-wide team would be what would be needed here. So please think about it and let me or Joe or Rachel know what you think asap. Some people are getting pretty creative (or bored??) over half-term! Three Letchworth girls made today's (apparently slightly chaotic) photocall at the Saracens training camp. There are pictures of the entire turnout on the Herts blog but Phil - Natalie's dad - also came up with some (arguably rather better) shots. Such as this one. Still, despite waiting around for a rather longer period than expected everyone seemed to have a good time - an dthe county kit looks pretty impressive. What a day to remember!!!! With several players missing through injury or holiday the under 17s traveled to Rochford with their numbers significantly dented. In what now appears to be the norm for Letchworth sides the majority of the U17s arrived at the ground significantly later than other teams and just 12mins before their first game was due to start. And so with minimal preparation the girls kicked off in their first game against a combined Rochford and Basildon side. The lack of preparation was obvious. 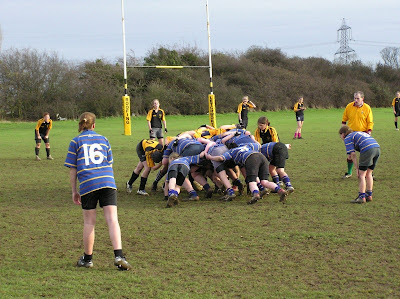 The girls lost every scrum and every lineout and hardly created a strong attacking platform. 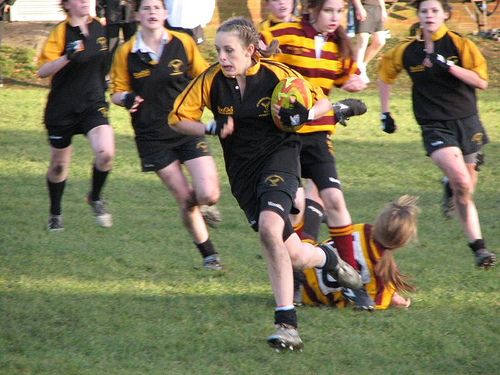 However the girls played percentage rugby and refused to play anywhere near their tryline. The hard work eventually payed of when Hayley crossed early on in the second half to take the score to 5-0. Some outstanding defensive work from the backline meant that Rochford were kept at bay and the girls ground out their first win. With the late withdrawal of Bodiceas the girls now had time to relax and rest before their next game against Diss. With far more time to prepare in the way they've become used to the girls went into their next game full of confidence and belief in their capabilities. The result told it all. The girls put 4 past Diss with two tries from Hayley one from Nattalie and one from Nim the difference between the teams was obvious for all to see. The girls coming away with a 26-5 win. 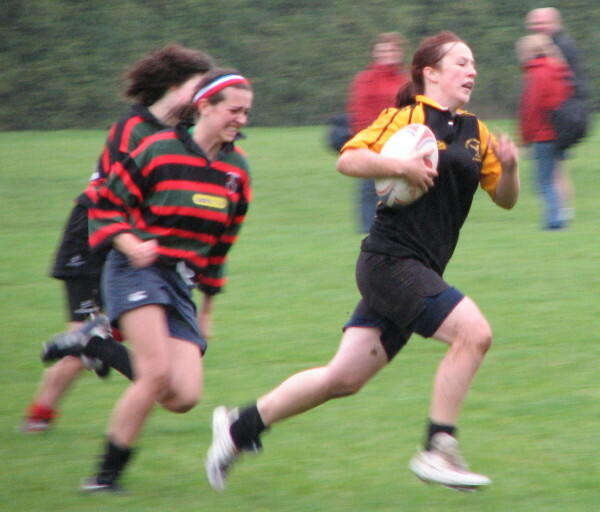 Special mention to Rosie Randfield who stepped in to play second row and played exceptionally well. And so came the last game of the group and a game that would decide which team progressed through to the tournamend final. The girls, now realising that if the opposition cant get to their try line then they cant loose, played some wonderfully simple low risk rugby. They kicked out of their own 22 and played all of the game in the Saracens half. The pressure turned into points with Hayley crossing for her 4th and 5th tries of the day and Nattalie crossing for her 2nd. The girls aran out 15 - 5 winners and progressed to the final where Sudbury lay waiting. Suddenly a switch flicked and the girls began to realise how close they were to winning their first tournament. With the rain now pelting down the squad ran onto the pitch determined not to come away empty handed. The final was a very evenly matched afair but the girls stuck to their game plan refusing to play out of their own half. Again the pressure paid off. 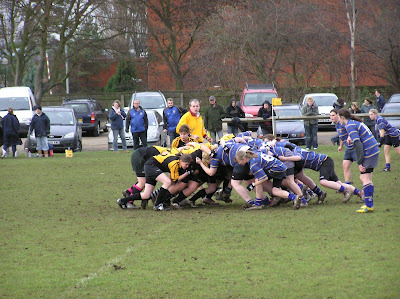 A Letchworth won their own scrum 10m out and Katie picked up and scooted throw the defence to score her first of the season. Sudbury came back strong and Letchworth spent most of the second half defending. 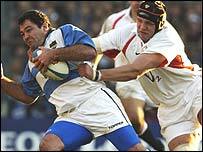 Three brilliant covering tackles from Nim preventing a very quick winger from out flanking the defensive line. Finally the referee called last play. Letchworth won their scrum and nim smashed the ball into touch. And so the celebrations began. Scoring 9 tries in 4 games and only conceding 1 says something for the way in which the squad played. No wonder the girls were so ecstatic with their performance on the day!!!!! And now for the formalities. Player and Most Improved Player of the tournament. Myself and Mike have discussed these awards and had great difficulty in selecting the players for them. It says something when a Westcliff coach standing watching the game winces at the sight of the Nim flattening one of the Sudbury girls. Several covering tackles combined with a solid boot and the ability to perform under pressure caught the managements eye. Without Rosie voluteering to play second row we would have been without a complete scrum against Diss. Not only did she play second row she looked a natural and has now found her second position. Her speed and enthusiasm for the ball was evident throughout the day. She even found a new role as lineout jumper. Finally I would like to mention one more member of the team. Sasha playing for her home club and our final opponents, Sudbury, took defeat very gracefully. Our thanks for not being on top form in the final. Much appreciated. I want to thank all the girls for a brilliant day and I think now you all realise what you can achieve when you work together and put your minds to it.